Tumbledrop, originally a browser game for Mac and PC alike, falls under the familiar physics-based puzzle genre and while there is certainly no shortage of them in the AppStore, Tumbledrop is one that definitely gives the rest a run for their money. Developed by Starfruit Games, the first thing you’ll notice about Tumbledrop are its cupcake and cotton candy graphics. The adorably emotive modular pieces are set against a background of clouds and stripes and polka dots while passing the level sends a rainbow across the sky and a chance to win a star or heart award. The background music and sound effects are equally light and perky. With Tumbledrop, the objective is to get the pink star down to the ground (sometimes with a hill, sometimes a seesaw) safely by selecting the yellow shapes to make them disappear. Yellow shapes aren’t just your typical squares and triangles but crosses and stars and even balloons. Between each selection is a period of downtime before you can select another one, which will prevents players from passing a level purely by ‘brute force,’ if you will, which adds a nice new challenge to the typical physics-based puzzler mix. Tumbledrop is split into Easy, Medium and Hard modes, 60 levels total with more coming soon and even then, within each level are three ways to pass. 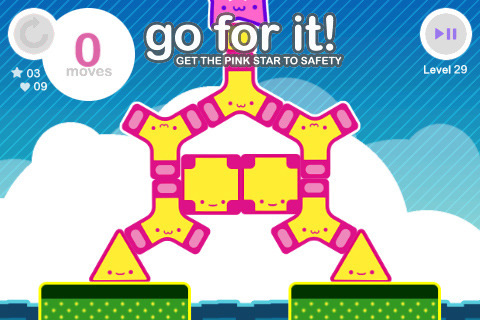 There are no minimum or maxium requirements to pass a level, so long as the pink star lands safe and secure but landing the star at or under a specified number of moves will net you a Star award while landing the star in or over a specified number of moves will earn you the Heart award. This is kind of cute, seeing how happy the yellow shapes are when you select them that earning a Heart award for using most of them makes me think that I’m just so benevolent and heartful to have used all of them. Nominated as a finalist in the IGF Mobile 2010 Awards in Technical Achievement, Tumbledrop is an exquisitely designed game that is pleasant to play but challenging enough to keep you stimulated. Get it in the AppStore for $1.99 or try out the Free version to get a taste first. AppSafari review of Tumbledrop was written by Aucoeur Ngo on March 4th, 2010 and categorized under App Store, Featured, Fun, Games. Page viewed 2767 times, 1 so far today. Need help on using these apps? Please read the Help Page.